Whenever Austrian artist Aronja reaches for a brush, beautiful landscapes take shape. 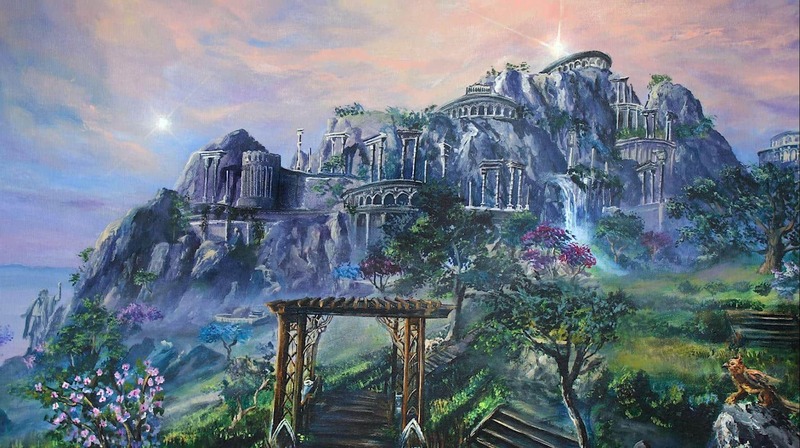 When ESO: Summerset was published earlier this year, we asked her to paint the majestic island of Artaeum. Learn more about her creation process and find out how to win one of her original ESO landscape paintings for yourself. Aronja is a 26-year-old student from Austria who uses her spare time to paint gorgeous pieces with acrylics, oil, and watercolors. Most of her work features incredible landscape impressions of the different worlds that players can explore in games such as The Elder Scrolls Online, and she records the creation of many of her works using time-lapse videos, which you can find (and marvel at) on her Youtube channel. A huge fan of the High Elves, after she first visited locations like Shimmerene or Alinor in ESO: Summerset, the ruins on the lost island of Artaeum opposite the Ceporah Tower quickly became her favorite location. The result was the stunning painting below. In addition to the "normal" image displayed above, Aronja recreated this beautiful landscape as she envisions it inside a mindtrap, much like the one featured in the ESO: Summerset’s tutorial. Earlier in the year, a very lucky winner took home one of the two original paintings at the ESO Tavern in Cologne, Germany. Now, we are giving away a second original piece, too! To win the amazing mindtrap painting, follow the instructions below. Log into Twitter and visit the English, French, or German Twitter account. Find the tweet promoting this article and re-tweet it by Friday, December 28, 2018 at 12:00PM EST. Check out the official rules here. We’ll pick the winner at random from the entries and contact them by January 4, 2019. Good luck!